Our clients can avail from us a wide range of Paper Shredder Heavy Duty machine that is available in different dimensions. These provide different types of cuts and are capable of shredding a large number of papers at one time. Our range is instrumental in checking paper duplication and is reckoned for its robust construction, hassle free operation and low maintenance. 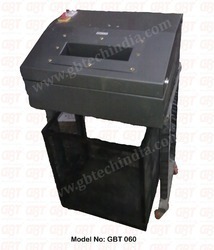 We offer a precision engineered range of Paper Shredder Heavy Duty machine that shreds 20-25 sheets at one time. Our range is known for its capability to prevent paper duplication. These are available in different sizes & dimensions and are offered at economical prices to the clients. Been size - 45 ltr Approx. Throat size - 300mm approx. 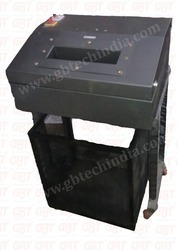 Paper Shredder Heavy Duty - GBT 060 Sheets designed at our unit is capable of preventing the replication of papers. These are available in different models and can operate at high speeds. The range offers different types of cuts and is known for its smooth operation, power saving capacity and low maintenance. 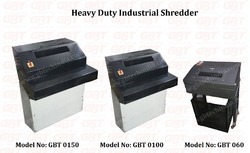 Paper shredder heavy duty - GBT 0100 sheets designed at our unit is capable of preventing the replication of papers. These are available in different models and can operate at high speeds. The range offers different types of cuts and is known for its smooth operation, power saving capacity and low maintenance. We offer a precision engineered range of paper shredder heavy duty machine that shreds 35-40 sheets at one time. Our range is known for its capability to prevent paper duplication. These are available in different sizes & dimensions and are offered at economical prices to the clients. Rest time - 10 minutes.